Comments Off on Moving through time slowly. Attila and I enjoyed the month of September, in which we went on a working holiday at the little house and then returned to work and chores at the country house. I’ve spent much of the last two weeks catching up with paying bills and working through all the paperwork generated by our two weeks of work at the little house. That was one expensive holiday. Also, there was a very high pile of bills and documents waiting for my attention when I arrived home, and they have taken up almost all of my free time since. I have almost caught up with all these fiddly bits! Our next project at the little house is to get the furnace working. Cold weather is on the way! The furnace needs a bit of attention, even though it is only a few years old. Actually, it is the duct work that needs all the attention. Previous renovators installed a new bathroom floor, which completely covered the heating vent. One has to wonder what they were thinking. We will have to cut through the floor in the bathroom to release the heat into the room. Also, the cold air return was almost completely blocked (don’t ask!) and now needs to be taken to bits and rebuilt. At our country house Attila is working steadily to bring all our wood into the wood shed. He has made real headway on the project; it is a lot of hard work. I am working six days next week, and so will wait to the following week when I have more time off, to begin charging the masonry heater for the winter. In the meantime Attila is building evening fires in the little wood stove in the basement, which is keeping the house at a comfortable temperature. 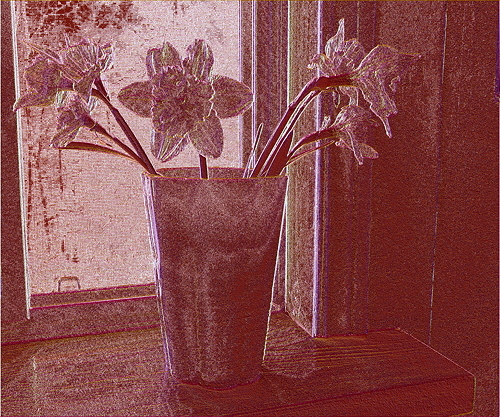 I brought the geraniums into the house this evening, as the temperature could drop to zero over the weekend. These are my first geraniums. I’m hoping to put them in a dark place for the winter and bring them back out in the spring. I won’t be putting a garden in pots on the deck at the country house next summer, although I may plant some tomatoes and such at the little house. That is a big maybe, because gardens need regular attention and I may not be able to supply it. Attila and I sit in our chairs at the end of our long, satisfying days, and most evenings we are waiting for bedtime! Aren’t we exciting! To go to bed too early is disastrous, as we wake up far too early in the morning and then are tired anew when we toddle off to work. I haven’t been taking all that many pictures of late, and they take quite a while to prepare for Internet publication. Tonight I fear that if I try to find and edit a photo, this entry won’t make it to the server at all. So I’ve forgone my usual image, for the sake of expediency. Attila and I are catching our breath. We took our vacation over the first two weeks of September. It was a working vacation. The day we left two Realtors took prospective buyers through our country house, the second one came in after we left for our little house in the city. It was extremely hectic, trying to plan, pack, load the car, prepare Mist for her maiden voyage to the little house and make sure all would be secure while we were away. Mist HATES car rides, and she spent a great part of the journey verbalizing her opinions. However, within five minutes of arriving at the little house, she was sprawled out on our bed and making herself right at home. She loves the little house! Our first task was to try and evict the chipmunks. It took three days, but we managed to block their entry and keep them from reentering the building. The dumpster arrived in our driveway on Tuesday morning of the first week, it was 20 feet long and 8 feet wide. Attila spent Tuesday gutting the basement. What a job! He removed drywall, studs, vapour barrier, insulation, doors, closets, ceiling boards, all stained with animal waste and covered with mildew. For this job Attila wore a disposable coverall with hood and a face mask during the entire project. Once all the materials had been removed from the basement the bad smells in the house began to dissipate. I also sprayed an alcohol solution on all the surfaces in the basement to kill mildew and spores and any viruses that may have been left behind by the evicted animal residents. The basement remains damp, as it has moisture issues that still need to be resolved. We purchased a large dehumidifier which has removed much of the dampness temporarily. However, we must dig around the foundation and put in proper drainage and water barriers before thinking about finishing off the basement. On Wednesday morning of the first week Attila tore the rotted decking off the back deck, and the frame that held it up, which was cobbled together and quite dangerous. All of the wood he tore out went into the dumpster. On Thursday morning of the first week Attila began removing shingles from the roof, which took all day Thursday and Friday. Saturday Lares arrived to help Attila shingle the roof, and they managed to get about a third of the job completed. Then Attila worked all day every day until the following Thursday to finish the job. I hope he never has to do that again, it is very, very hard work! Attila worked on cleaning up the roofing job on Thursday morning and then took the afternoon off, as there were torrential rains. How lucky we were that the rain started after the roofing job was completed! We drove through the countryside in the area, in the rain, and enjoyed ourselves. While on our drive we passed a pick-your-own apple farm, but it was too wet to consider picking apples on Thursday. The final Friday of our holiday, our first day of rest, we returned to the apple farm and picked ourselves a bushel of rosy red apples to take home with us. Then we headed to the city to shop. Our idea of shopping is to visit the ReStore, and other second hand shops, to look for building materials for our little house. We did buy a few small things, a curtain rod and a doorstop. Then we took ourselves out for dinner. We were so lucky that during our visit granddaughter Tink turned one year old, the twins Imp and Elf turned four years old, and Imp and Elf attended their very first day of school. It was great to see them. Attila and I agree, being a grandparent is just plain wonderful. So, while Attila was doing all his strenuous work on gutting the basement, dismantling the deck and putting a new roof on the house, what was I doing? Plenty! First I went shopping and bought a stove for the house. I wanted to buy a used stove, but without a vehicle to transport it home it just didn’t work. So, off I went to a chain store and bought the cheapest stove they had, which was delivered the first Tuesday of our two week holiday. And then I cooked! We ate like royalty the whole two weeks. Attila really needed to, with all the physical labour he was doing each day. The stove, although inexpensive, works very well. I shopped for several days, running to the building centre for Attila to pick up things he needed for his projects. I purchased small things from the dollar store, and larger things from the second hand stores. The role of chief cook and bottle washer was mine alone. I cleaned, cleaned, cleaned. Slowly I outfitted the house for comfort. 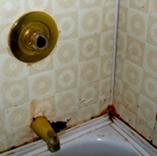 I did small “repairs” such as my fix for the bathroom faucet rot in the photos; which was very successful and we were thus able to take showers. On Monday and Tuesday of the second week Luna accompanied Janus on a business trip, and I stayed with Imp and Elf and Tink. What a great time we had! We stayed indoors, as the yard was being excavated for a new septic system. Elf had endless hours of entertainment there, as we moved a stool to the bedroom window so that he could stand and observe the excavation and the installation of the septic system. Imp enjoyed reading books with Gramma, and Tink just enjoyed everything! We all had a wonderful time. An added bonus of the holiday was that we got to see Terra and Lares almost every day. It was great to spend time, share meals and chat together. We look forward to moving to our little house, it will be so nice to have them near all the time. Terra is enjoying her new job, I believe she has found her true calling. The shift work is difficult to get used to, and being on call 24/7 is very wearing, and she is holding up very well. We arrived home Sunday last, tired and ready to go back to our jobs for a little rest and relaxation! I am working four days this week! Today is my one day off and Attila has left me with a list of places to call; I am on a verbal information gathering expedition. I must call metal roofing manufacturers and retailers for prices and delivery schedules. I must call waste management firms for prices and delivery schedules for dumpsters. I must call asphalt shingle retailers for prices and delivery schedules. We are going to be roofing very soon! We have our fingers crossed for fair weather! A big project, in terms of time and money. It has to be done. 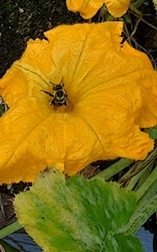 Bumblebee on a zucchini bloom. We will need a dumpster to discard the three layers of shingles that already exist on the roof. We will be adding all kinds of other building materials to the dumpster. Old carpeting (mildewed and disgusting), the existing deck boards (particle board! A silly, silly, silly choice! ), drywall, insulation and wood panelling, boards and who knows what else, will go into that dumpster. The little house has a distinctive odour, very unpleasant. We’ve wondered about the source. Part of it is the mildewed carpet which will go into the dumptster, part of it dampness from a water problem in the basement, but there is another smell that we thought may have been the toilet leaking. Yesterday Attila tore down the ceiling drywall in the family room below the bathroom. It wasn’t our toilet that has been causing the odour, oh no. A community of chipmunks have invaded the house, long before we purchased it, and they used/use that area as their toilet. And they are still in residence! Critters! We are not alone! Attila boarded up every exterior opening he could find and used steel wool to seal every tiny crack that wasn’t taken care of by the boards. We will have to completely strip down that family room; we will remove all panelling, drywall and insulation and then assess the damage and strategize the measures we need to take to permanently evict our unwanted tenants. Yesterday, while Attila explored the odour problem, I was busy washing the hardwood floor in the living room. It is badly stained and there are many nails visible to the eye. It is not a good candidate for sanding and refinishing. I am going to explore the option of painting the hardwood. I also put up newer canvas drapes in the corner window, allowing us privacy while letting in lots of light. Terra came over for a visit and helped me arrange the chairs in that sunny little corner. Now Attila and I will have a pleasant place to sit when we take short breaks from our labours. I still need to tackle the lower kitchen cabinets. There is still a bit of carpet down there that has to come out, disgusting! My plan is to remove the carpet, spray things down with alcohol, remove the rodent droppings and rodent food debris, wash the every surface with soap and bleach, spray a second time with alcohol, and paint all surfaces. Then I will measure and cut cedar boards to line the shelves, varathane the top surface of the cedar for wear and waterproofing and nail them into place. Only after all this is accomplished will I use the space for kitchen storage. The cedar boards are old spacers which we rescued before they could be burned as garbage. Attila and I have a busy few months ahead of us. Today the sun is shining and the day has started off cool and refreshing. Apparently that will not last, heat and humidity are predicted. I have the house wide open to capture the cool morning breezes, and will close it up tight as soon as the outdoor temperature is the same as the indoor temperature. The tomatoes are ripening on the deck garden! I am really looking forward to having a few home grown tomatoes this year. There is one zucchini! Better one than none. I won’t be bothered with another deck garden, it isn’t worth all that trouble for a half dozen tomatoes and one zucchini. I’m glad I tried it though, it was fun. Looking out the window this morning a bit of colour caught my eye. Up until today the view has been green, green, green. This morning a bit of yellow and red have stolen into the landscape. 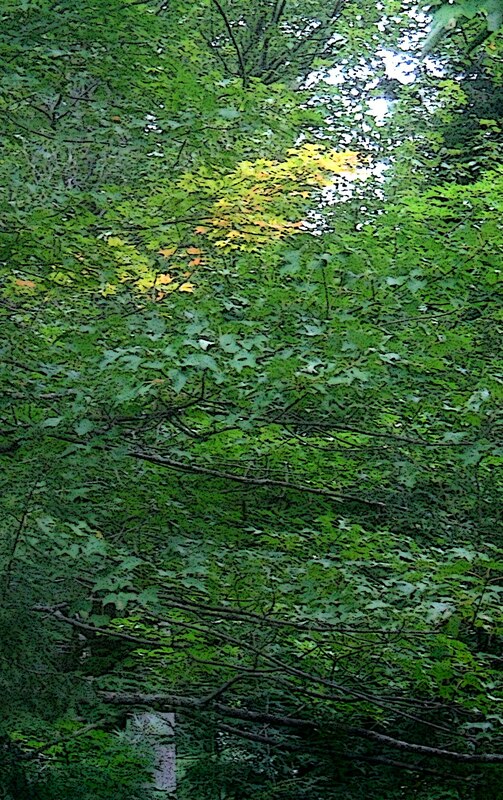 Autumn is on its way. It was raining again this morning, but not cold, or even terribly humid. I have only had to water my deck garden a few times this summer, the rain has arrived consistently to do the job. I’m not sure I’d go to the trouble again. Although we will harvest enough tomatoes, basil and zucchini to justify the initial cost of putting in the garden, it doesn’t yield enough to provide for more than few light meals. I am hoping that we can put in a more substantial garden at the little house, where bears aren’t an issue. I’ve two days off this week. I’ll spend my time preparing for our next excursion to the little house. The list of things to take with us gets longer and longer. Anything we take in the car during these visits will not need to be transported by moving van in the future. Some things are making the trip back and forth, like power tools, because we use them at both locations. Next week I have one day of work. My to do list is short today. I have a few phone calls to make, but I have to wait until after 9:00 am to make them. It seems I’m always waiting for the rest of the world to wake up! Most of the morning chores are already done, just the bed to make and then the house is ready to “show”. I think it is time for me to return to my book project, which has been neglected all summer long. The Canadian research is complete, I just need to pay to see the US records to fill in the blanks for one line of the family. However, I hesitate to spend any money on such non-necessities, because we are supporting two houses and a car. Perhaps I’ll publish without the US relatives, one has to work within one’s means. Attila and I decided to stay in our country home this weekend. We both worked a six day week and although Attila does this week after week, I am not accustomed to so much consecutive work. I am surprised that I am not worn down, not at all. I feel quite energetic and a little restless; I’m looking forward to our next visit to the little house! After preparing bread dough a few weeks ago, a portion of it went into the freezer to be used as pizza dough. This morning that dough was removed from the freezer and placed in the refrigerator and tonight it was topped with all our favorite pizza toppings. We haven’t made pizza since last June, so this is a rare treat. However, my timing was off, the dough was frozen after the second rise and didn’t rise at all when baked. The meal was flavourful, but the texture of the dough was disappointing. My deck garden is an interesting project. 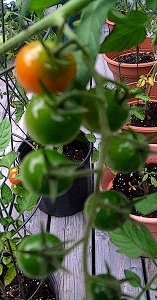 The tomatoes are coming along moderately, with a few cherry tomatoes already ripened. The swiss chard is a complete failure, about three inches high and going nowhere. The basil is limping along, there will be some to harvest but not enough to satisfy our needs for pesto. My red geranium is preparing to bloom again, after a two week hiatus. We have two small zucchinis that look like they will mature, and one butternut squash the size of a large marble. Attila continues to move firewood into the wood shed, in preparation for the winter. Today was wet and chilly and the idea of a roaring fire seems quite inviting. We won’t begin to charge the masonry heater until after Thanksgiving. The people who viewed our home have made no further enquiries. We are not surprised, as we don’t expect any activity on the house sale until next spring. Still, we are prepared with plan A, B, C and D, just in case the house does sell, before we remove it from the market for the winter. We have no plans for tomorrow, our big day off. Perhaps fate will intervene with a pleasant surprise; then again, perhaps it will be a relaxing day of puttering for both of us.